The Board is principally responsible for directing and controlling the business of the Company and ensuring its long-term economic, social and environmental sustainability. This responsibility includes it being the deemed Board of the Transnet National Ports Authority in terms of the National Ports Act. The Board leads the Company in its achievement of strategic objectives by directing and approving the Company’s overall strategy and associated operational objectives. It monitors the Company’s performance against the targets outlined in the Shareholder’s Compact and ensures that adequate processes are in place for budget planning and allocation to advance the Company’s mandate. This includes oversight of the Company’s socio-economic programmes. The Board is accountable for leading the Company ethically and effectively. The qualities of integrity, competence, responsibility, fairness and transparency are cultivated and exhibited through the Company’s compliance with legislation, rules and binding codes, underscoring its responsibilities as a good corporate citizen. The Board is committed to implementing the King IV Code on Corporate Governance. The Board governs and directs compliance with applicable laws and adopted, non-binding rules, codes and standards. The Board delegates the responsibility for implementing the compliance function to management. To this end, the Company has an established Compliance function. As is the case with all the Company policies, the Compliance Policy is reviewed every five years in accordance with the Company Policy Framework or updated as and when required. The Compliance Policy forms the foundation of the Compliance Framework. The Board considers non-compliance with legislative requirements a key risk, as it not only exposes the Company to fines and civil claims, but can also result in loss of operational authorisations and reputational harm. The Board oversees compliance management and has delegated the review and approval of the Company’s Compliance Plan to the Risk Committee. The Compliance Plan details procedures for identifying regulatory risks and monitoring compliance with applicable regulatory requirements. The Compliance Plan is aligned to the Company’s strategy to mitigate compliance risk exposures emerging from the execution of the strategy. The PFMA requires the Board to ensure that the Company and its employees comply with the provisions applicable to Schedule 2 Companies, as well as any other legislation applicable to the Company. Accordingly, the Board – in its capacity as the Company’s accounting authority – ensures that the Company adheres to the requirements for the assessment of risk and annual budget submissions, and the annual conclusion of a Shareholder’s Compact. The Board also further ensures that the Company adheres to all procedures for quarterly reporting to the Executive Authority through submission of quarterly PFMA reports. The Board has noted the ineffectiveness of supply-chain related controls, which resulted in significant irregular expenditure in terms of the PFMA, as highlighted within the annual financial statements on pages 15 and 16 of the Report of the Directors as well as Annexure E, from pages 116 to 120. The Company reports on the extent of its compliance with the Companies Act in the Directors’ Report. The Board is committed to the application of King IV governance principles in conjunction with regulatory provisions to achieve the overarching principles of sound governance, namely an ethical culture, good performance, effective control and operational and social legitimacy. It intends to do so substantively and not simply in form, so that its decisions and actions impact positively on the Company and all its stakeholders. The Governance Assessment Instrument is utilised to monitor the level of application of the King IV principles. 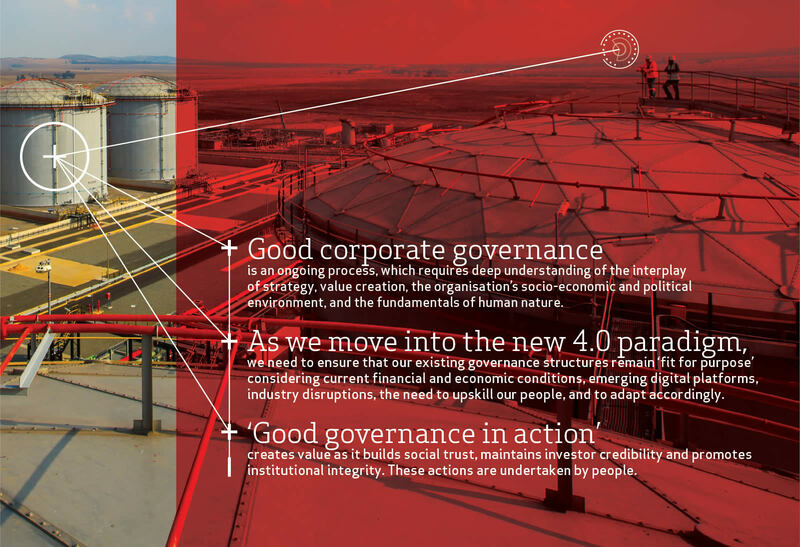 During the reporting year, Transnet adhered to some of the King IV principles and recommendations as evidenced in the Integrated Report, Remuneration Report and the Sustainability Outcomes Report. At the time of publishing this report, the Company was attending to gaps identified through a King IV gap analysis performed during the 2018 financial year. 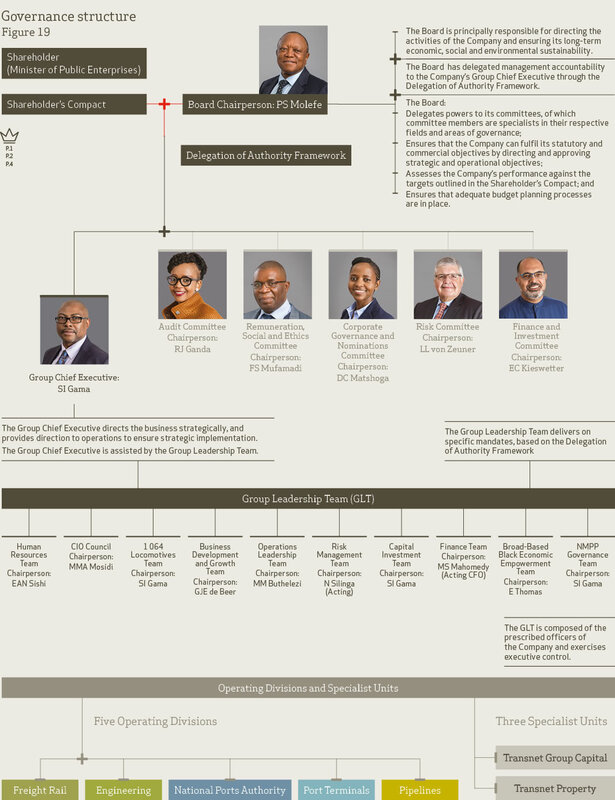 Once complete, the outcomes – and appropriate steps taken to address the gaps through the applicable governance process – will be reported on the Company’s website (www.transnet.net/GAI), as part of the 2019 Integrated Reporting Suite. Matters relating to regulatory, human resources and policies. 1	Subject to the Memorandum of Incorporation of the Company, the PFMA, and such other applicable legislation, on the basis of any recommendation as may be made from time to time by the Group Chief Executive. The Board evaluates its performance and that of its committees, Chairperson and individual directors through an annual independent evaluation and provides ongoing support for continued improvement. The process is facilitated by an independent service provider. Technical engineering expertise and cost. In terms of the appointment, induction, training and succession planning of directors, King IV recommends that a programme be implemented by the Board to ensure a staggered rotation of non-executive directors to the extent that this is not already regulated by the Company’s MOI or other relevant legislation. In terms of strategy, compliance and group performance emphasis is placed on Boards’ focus on the achievement of value creation as set out by King IV and aligned with leading practice trends. The Board should ensure that the Company strategy is expressed in terms of performance that creates value in a sustainable manner within the economic, social and environmental context in which the Company operates. Action plans are being developed to address the gaps. The appointment of the new Board in May 2018 addressed areas of improvement, which included the balance of skills and filling of vacancies. The Board Evaluation Report is generally tabled for noting at the annual general meeting. 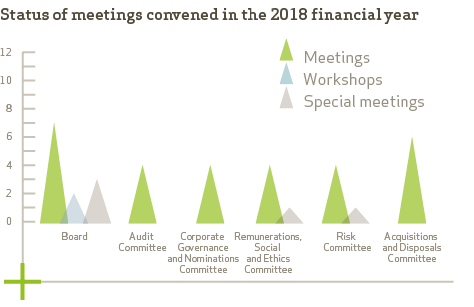 The Group Company Secretary develops an Annual Board Training Plan to support the enhancement of skills of members of the Board and its committees. Individual directors are encouraged to identify any training events they may wish to attend through recognised training institutes as provided by the Group Company Secretariat. A full list of training activities conducted during the year with the Board by external training service providers is provided in the Governance Report available online at www.transnet.net. It is submitted to the Shareholder for information purposes. The Board comprises an appropriate balance of knowledge, skills, experience, diversity and independence, enabling the objective and effective discharge of its duties. In accordance with King IV Code, the Board is satisfied that the non- executive directors of the Company are independent. The Board of Directors serves as the focal point and custodian of corporate governance in the Company. The protocol for exercising its leadership role is outlined in the approved Board and committees’ mandates. The mandates clearly define the procedures for the Board and committees to obtain professional advice and the procedures for management to submit documentation for the Board to make informed decisions. The Board has interrogated the reports relating to the year under review in line with its mandate, and to date is satisfied that it has discharged its responsibilities. On 28 May 2018, the Board dissolved the Acquisitions and Disposals Committee.